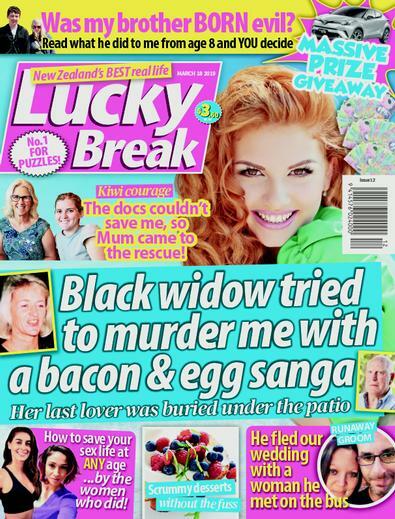 Subscribe to Lucky Break magazine for your Chance To Win a Trip for 4 to Rarotonga! Every single issue of Lucky Break is packed full of amazing tales of betrayal, love and overcoming the odds from people just like us. Plus there are heaps of puzzles with awesome prizes like cars, holidays, TVs and cash. We have delicious, easy to follow recipes, stylish fashion, psychic advice, beauty tips, money-saving hints and much, much more. Lucky Break is a weekly title. Please allow up to 2-5 weeks for first issue delivery. Great magazine and puzzles, has real life and interesting stories to read. ENJOY READING THIS MAGAZINE, WITH RECIPES AND TRUE LIFE. This is published 51 times per year, please allow up to 2-5 weeks for your first delivery. Your subscription will begin with the next available issue.